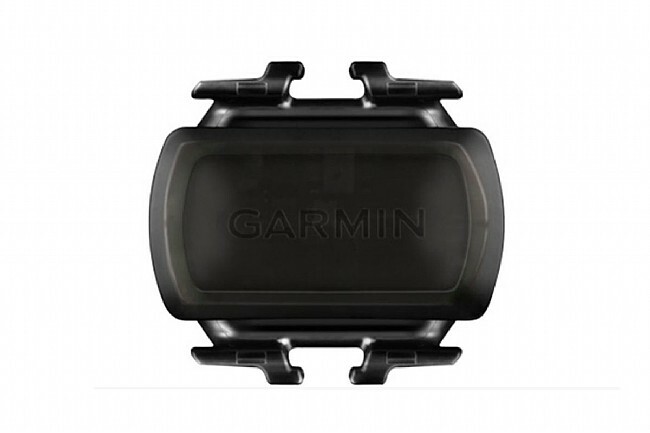 Attaching to any crank arm, the Garmin Edge Cadence Sensor will help you get the most out of your riding. With no magnets to line up and no wires to worry about, installation using the included straps is incredibly simple and easy. Auto syncing with your Garmin Edge head unit, switching between bikes is a breeze as well. The Edge Cadence Sensor is ANT+ compatible and measures cadence in pedal strokes per minute. A sensor so nice I bought it twice - or three times, actually. I've got one on each of my bikes so I can track my cadence on any ride. This one paired easily with several Garmin meters (Edge and Forerunner models) as well as several training apps including Trainer Road. Definitely worth the investment. More information for your cycling pleasure. I have a Garmin cycling GPS and this was my first additional option. It was easy to pair with my GPS and provides some interesting information. Like most riders I would guess, I found I should up my RPM's after getting a baseline. I like the average RPM which shows when I download it to Garmin Connect. Just received Garmin Cadence Sensor after only 2 days after purchasing. Attached to crank arm. Turned on my Garmin 1000 bike computer. Spun crank twice and Garmin found the sensor quickly. Just rode 60 miles and no issues with it. It Works, and No More Magnets!! Attaches to your crank arm, with a 3-band rubber strap. No magnets, nothing else needed!! Simply pair it up with your computer and you're good to go!! That's it!! I bought this to replace one that stopped working after several years. Works as intended with no problems at all, although I do think it is a bit over priced. This couldnt be easier. Strap the cadence monitor to the crank arm, automatically pair up to my Garmin 520 and off I went. Records average and max cadence and real time cadence during your ride. It works as advertised and is just one more tool to enhance my ride. Love it!!!! I have installed the new separate cadence and speed sensors on two of my bikes. The cadence sensor was very easy to install and pair with my Garmin 800. I'm no longer stopping once a ride to fine tune the angle of the old GSC-10 pickup. And I'm also not concerned about scarring the finish on the chain-stay adjusting the angle. When I first saw the new cadence sensor I was fairly sure it would be a while before I bothered to buy one because I have a GSC-10 on each of my bikes. Now I wonder what I'm going to do with the pile of GSC-10s I'm accumulating. I like the clean install of this cadence sensor over the GSC-10. The install on the crank is simple. Once installed and found by my Edge 810, it works as well as the GSC-10. This was a replacement for a sensor that failed after several years of use and abuse. It works very well with my Garmin 1000. I use it as a constant reminder of whether I am in my zone depending upon equipment, terrain, and pace. Think of it as a continuous training aid. Used to monitor cadence, which is what I focus on. Attaching to any crank arm, the Garmin Cadence Sensor will help you get the most out of your riding. Super easy to setup. You will need to remove and reinsert the battery to get the unit to pair with your Garmin. After that just a few revolutions is all that is needed for the Garmin to re establish the connection before every ride. Highly recommend!